Blessings, Miracles, &Thoughts in Between: 38 week update! Total weight gain: As of today I'm up 25 pounds. I really pack on the pounds in the last few weeks! Maternity Clothes: Yes! And most of my shirts don't properly cover my belly! I'm down to just a few things that are actually comfortable to wear and appropriate to leave the house in. Stretch marks: Yes. I'm super sad about this but I have a handful of stretch marks on my lower belly. I'm realizing just how lucky I was to make it through Kate's pregnancy without any. Best moment this week: Seeing Will on ultrasound today - it was my last OB ultrasound ever! He looked great - and big! Measured in right at 8 pounds! Movement: Any movement hurts so badly. He has run out of room and his stretches make me feel like my body might split in half at any moment. Food cravings: Food is not really my friend these days. My stomach is so squished that eating just makes me feel sick. Labor signs: I have timeable contracts several hours a day but they always fizzle out. Belly button - innie or outie: It's an outie. Not a super outie but it does stick out some. What are you looking forward to this week: Meeting our sweet boy! I am ready to see his face and not be pregnant any more! I can't believe it's actually baby week! This week has been a bit stressful - lots of appointments, lots of emailing with Will's specialists, and lots of planning but I think we finally know who is doing what, when and have a plan in place! I had my pre-op Monday morning and got the official word that my blood levels look great, as does my heart, and I will be able to have a spinal and be awake for my c-section! I am so excited, and a little nervous, about being able to actually be a part of his birth! This is definitely an answer to prayers! We had a wonderful last weekend as a family of three and a great, low key Easter. Kate still isn't able to be in places like church or around a group of kids so we couldn't attend services. We tried to make Easter special though! 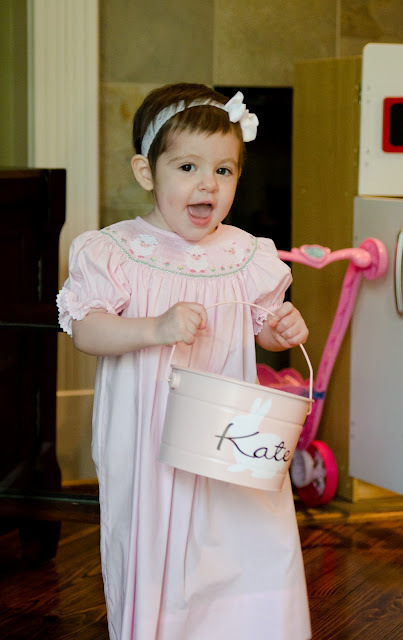 She had a blast with her basket, loved hunting for eggs in the house, and listened to a bit of the Easter story before moving on to something else! I have no clue when I will get around to posting all of our Easter pictures so here is a peek! She was so excited every time she found an egg! I'm fairly certain the next time y'all hear from me I will be announcing the arrival of a certain little boy named Will! 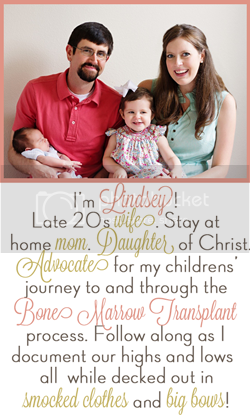 Lindsey, congratulations and good luck with everything. We had our little girl at 34 weeks and it was the best experience of my life! You look amazing! Cannot wait to see pics of you new bundle! Yay! Love your top, you look wonderful! I am so excited for your family!! Kate looks like a big sister alright! Love seeing her sweet face! I'm so excited for you, and can't wait to "meet" Will! Good luck, mama. yeah! you look great, and can't wait to hear about the arrival of will ;) hugs to your family! YAY baby week!! Cannot wait to "meet" Will. You will all be in my thoughts and prayers this week. You look amazing! You are adorable. Looking forward to Will's announcement. Good luck with everything! Tomorrow!!!! I cannot believe it is time to meet Will. I began following your blog probably Eight months ago during Kate's transplant (no idea if that's the right term, sorry). And now To see Kate looking so healthy and happy as you all are about to welcome Will is just heartwarming. Sending prayers for your family and your doctors! You look wonderful mama! 25lbs sounds amazing to me--but I'm guessing I'll be up higher than that this time. I cannot believeeeee it's almost WILL TIME! eeeeeeek!!! Can't wait to see his cute face! You look beautiful in that picture! iPhone Picture Dump: Hospital Stay!